On the afternoon of December 28th, 2009, Chris Clark was getting himself ready to head to the Verizon Center for a game against the Carolina Hurricanes. 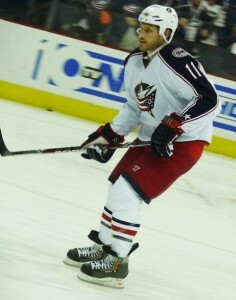 He was then informed that he’d been traded, along with defenseman Milan Jurcina, to the Columbus Blue Jackets. You can almost imagine that his first reaction was an incredulous “who?“. At the time, the former Capitals captain said “I’m shocked. But then you start looking to the team where you’re going. So now I’m trying to put all of my energy into who’s on the team, how they’re doing and where I’ll be playing my next game“. He was going from a Stanley Cup contender to a team that was in the midst of a losing streak that defied pre-season expectations. Clark was drafted by the Calgary Flames in the 1994 NHL Entry Draft. He played from 1994-1998 at Clarkson University before moving up to the Flames AHL affiliate Saint John Flames. He first suited up for Calgary in the 1999-2000 season. During the lockout in 2004-2005, he played for clubs in both Switzerland and Norway. He was traded to the Washington Capitals as a restricted free agent in August of 2005. One year later, in September 2006, he was named the captain of the Capitals. Injuries sidelined him in both the 07-08 and 08-09 seasons, when he played only 18 and 32 games, respectively. And then came the trade. The South Windsor, Connecticut native has come to embrace the city of Columbus and seems ready to meet the challenge of helping this club get back to the playoffs. At the age of 33, he fills a void in the locker room that has been missing from last season; that of the veteran voice. I recently sat down with Chris and talked about the trade, the coaching change, the Hartford Whalers and his future with Columbus. Two months after being traded, has the shock worn off and how is it playing for this club? Yeah, it’s definitly worn off. It didn’t take long because once you get into the group of guys you become one of their teammates. The guys were great to me here, they welcomed me. It was an easy transition that way with the guys. It was learning the system and that came pretty easy. I became focused on what we needed to do right away, and that was to win games. Was it a feeling of deja vu being traded to a team that wasn’t doing very well? It was very similar. At the time (being traded to Washington), it was all young, first round draft picks. It was very,very similar to what it is here. All they needed at the time was experience. Looking at our team (Columbus), all we need is experience. They got a good playoff experience last year, and that helps out a lot. I think if we can get in the playoffs this year, it’s just going to build. You know, each game is another day in the NHL for these young guys. Every day is a learning experience. It doesn’t take long once it clicks, once the young guys become veteran players. It should turn around very quickly. Do you see yourself becoming more vocal in the locker room as that “veteran voice” for the younger guys? It didn’t take long because the guys are very open to anything. Even now, the young guys are starting to speak up because they feel more comfortable with it. That’s something I tried to do while I was in Washington, to get everybody fitting in as soon as we can. Nobody has any wrong ideas; you just talk, it’s an open dialogue. Some teams have that hierarchy where you don’t say anything (as a young guy) until you’re a certain status. That’s not the way I like to play. When I was in Calgary with Jerome Iginla, that’s the way he did it (being vocal) and he was one of the guys I looked up to when I was coming up. So you like more of a family-type of atmosphere? If guys aren’t comfortable, they’re not going to play at their best. You’ve got to get guys, especially young guys if he’s a first round draft pick next year and he’s coming in, you get him into the team as quick as you can. Because as soon as he’s comfortable playing the better he’s going to play, and the better the team’s going to play. I think it’s key to get that happening. Many former teammates, including Milan Jurcina, have said you made their transition into the NHL easier. You try to keep that atmosphere in the room. You don’t want guys not wanting to come to the rink. Whether it’s coming from the coach down, or the older guys down or even the young guys, we want guys that love to come to the rink. You want them to be excited when they wake up in the morning, you know “let’s get back out on the ice”. What’s the biggest difference in the room as a result of the recent coaching change? It’s a little bit looser, but you know, sometimes you need a change. It let the air out of the room because guys seemed to playing too tight. It came to a head at the time. Claude (Noel) came in and he brought back a little bit of fun in the room, in a professional way. It let guys just relax again. Not to the point of not paying attention and being too loose, but it gave them a chance to prove themselves to their new coach. We have very skilled guys in our top two or three lines and they were allowed to do a little bit more offensively. Once they crossed that blue line and they got it in, they were allowed to make a play and not be as worried to make a mistake. When mistakes are made, guys are hustling to atone for that mistake. Is this a direct result of playing under coach Noel? I think so. We know that we’re accountable. Claude says “if you can make that move, it better work. If not, you better be that guy back and making sure it (the puck) doesn’t find the back of the net”. And I think that’s fine. The league now, from the blue line in, is super skilled. If you look at the top teams, they’re not dumping the puck in. They’re skating the puck in to make a play. I think that’s something that our young guys have the talent to do. Growing up near the Hartford Whalers, were you a fan? Do you still have the Brass Bonanza (Whalers goal song) as your ringtone? I’ve always been a fan and still am of the Whalers. I did have the Brass Bonanza as my ringtone but I lost it because I switched phones and couldn’t figure out how to get it back. That song still gives me goosebumps. Your family is still living in Washington. With one year remaining on your contract, any plans on moving them to Columbus? It would’ve been too disruptive to move them with school still going on. They’ll move here this summer. I’ve been here two months now and I’ve had a chance to drive around the city and the suburbs and look around. Dave Steckel (former OSU Buckeye) lives here in the summer. He told me all about Columbus and the great school systems. It’ll definitely be a place to stick to. Columbus has everything guys look for outside of hockey and it’s definitely someplace we’d like to stay.